As the Great Depression moved into its third year, unemployed Chicagoans were finding new ways to make ends meet. Some of them were becoming farmers. The Cook County Board was setting aside sections of its forest preserves to be plowed, with local relief agencies distributing seed to any needy person willing to work the land. International Harvester had leased property on the Southwest Side, so that some of its 4500 laid-off employees might have a section to cultivate. Meanwhile, out in the neighborhoods, community leaders were becoming active in the back-to-the-soil movement. So were organizations like the Red Cross, the Urban League, and the Cook County Federation of Women’s Clubs. 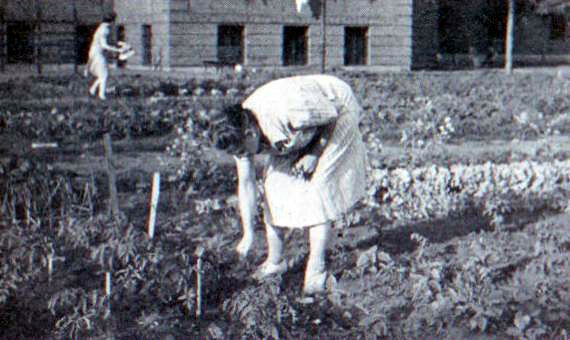 City people were planting gardens in backyards and vacant lots. Potatoes, turnips, carrots, and parsnips were the most popular crops.